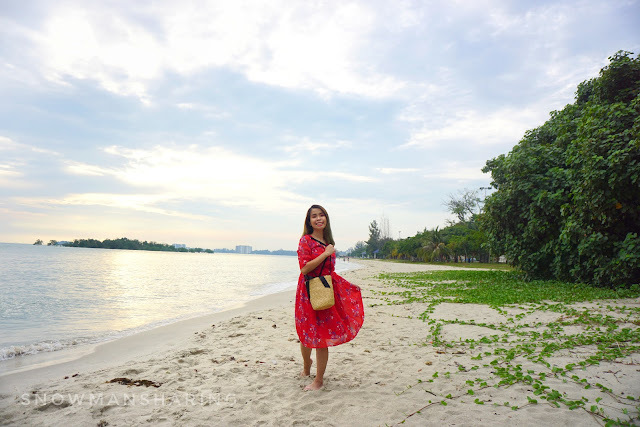 Start my first vacation weekend outfit post with this really striking red dress. 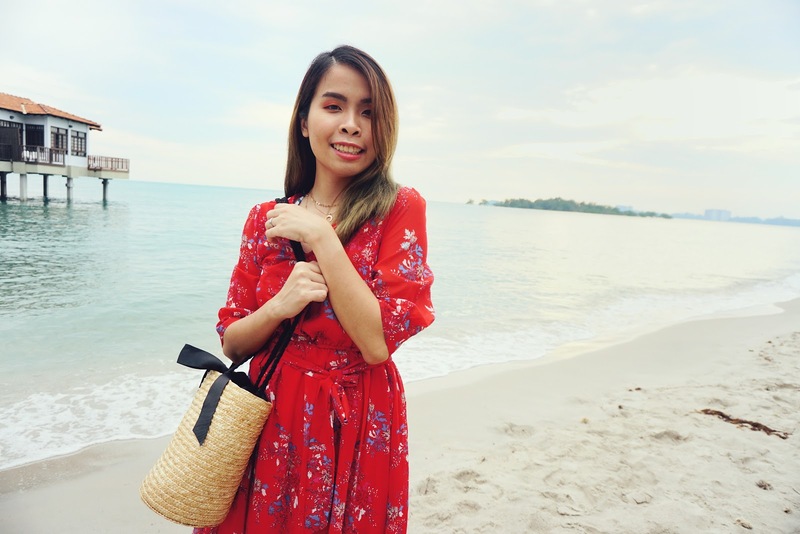 I have never been a red dress girl but whenever I think of beach or summer holiday red is my top color of choices. For this staycation, I prepare this red dress for our first-day beach shooting. A red dress is always the perfect summer dress for a beach vacation. I'm looking for a long red dress that is flowy and comfortable to wear. This red dress comes in pretty flowers pattern which adds some pretty patterns on the dress. It comes with a ribbon tie as well. Although it is a loose A-line dress, with the tie ribbon you can tie on the waistline to enhance your waistline area. 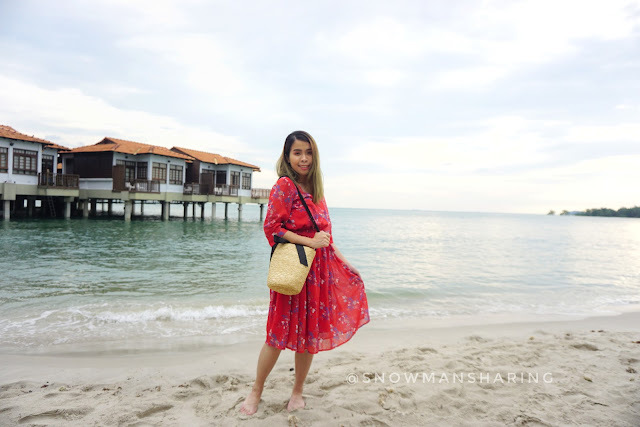 My one and only rattan bag are also perfect for a summer beach vacation. 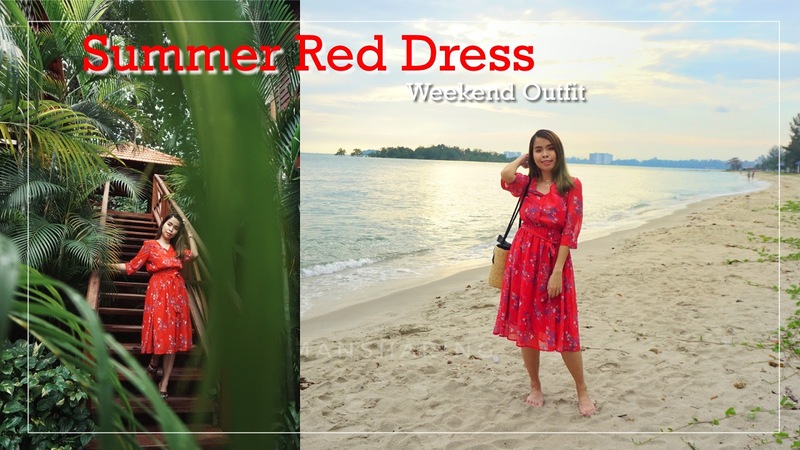 The red color is such a fun contrast when you wear to beach or summer vacation. When blue skies and beaches together in one photo, a red dress can always be the center stand out color too. Post some of my favorite shots on their private beach. You can actually walk along the beach to the other side. But since we are short of time, we didn't manage to explore there. 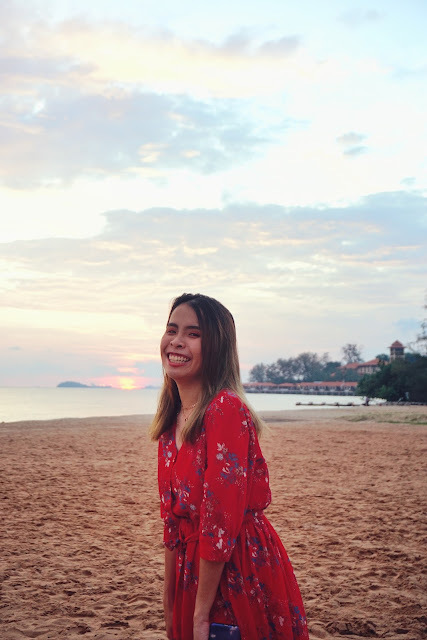 Although it was a short visit to their private beach at Avilion Hotel Port Dickson, we still manage to get some nice OOTDs shot with the sunset background. 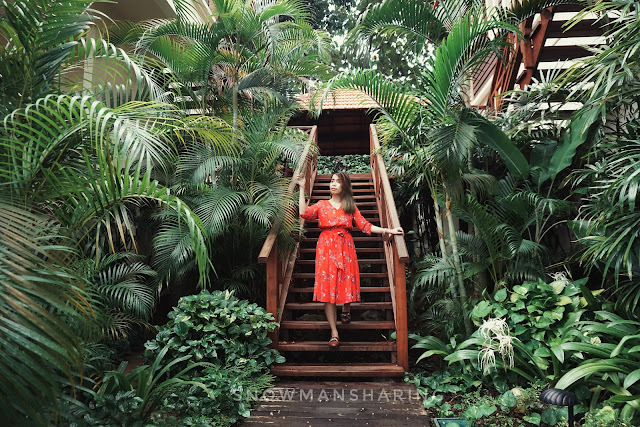 Not only that we manage to explore some of their Garden Villa and OMG those villas are so pretty!! 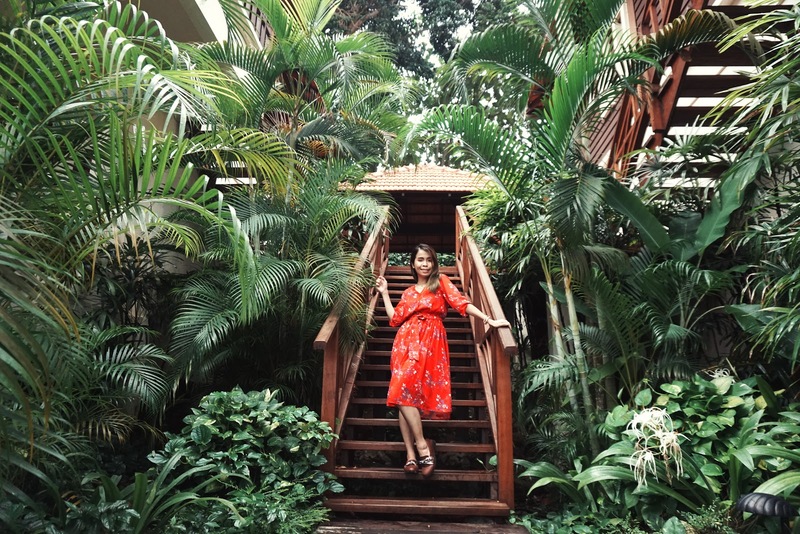 I saw this super Balinese style staircase and we took few shots here with this particular staircase. I love these few shots here too, Greens and Red dress to compliment. 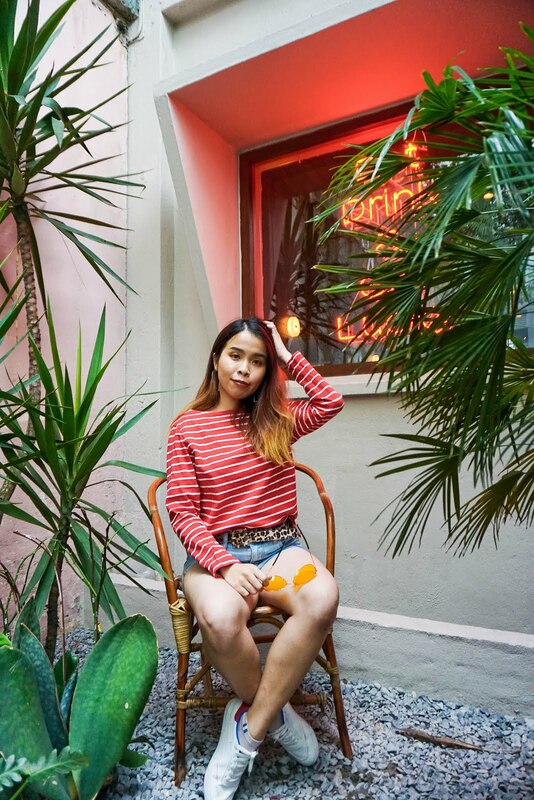 Super summery feel I can say! 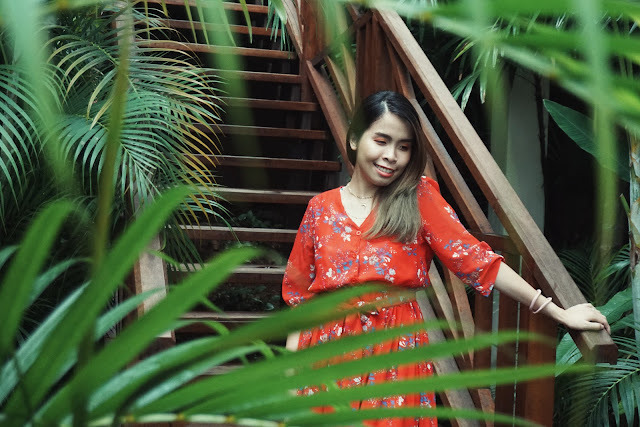 The last one photo ended my weekend outfit post with my super candid laugh shot with a glimpse of eye yolk. This shot was pretty funny because while we are going to have our dinner, we pass by and saw this beautiful sunset view. Immediately we stop by and take a few shots of photos with the sunset. I am really glad that we manage to see this beautiful sunset together. Although the moment was short, beautiful memories last forever.